Publishing shifts is a confirmation of a schedule/roster and allows the shifts to appear for your employees. Publishing shifts is simple. A yellow button will appear in the top right of the Scheduling page that will tell you how many shifts on your sheet are unpublished. When you click this button, there a pop-up box will appear where you will go through three steps before publishing your shift. Yellow shifts are unpublished, while green shifts have been published. Publish Updates Only - This option is for managers who are amending already completed schedule sheets. This means that if some shifts have already been published, it will only alert people about schedule amendments. 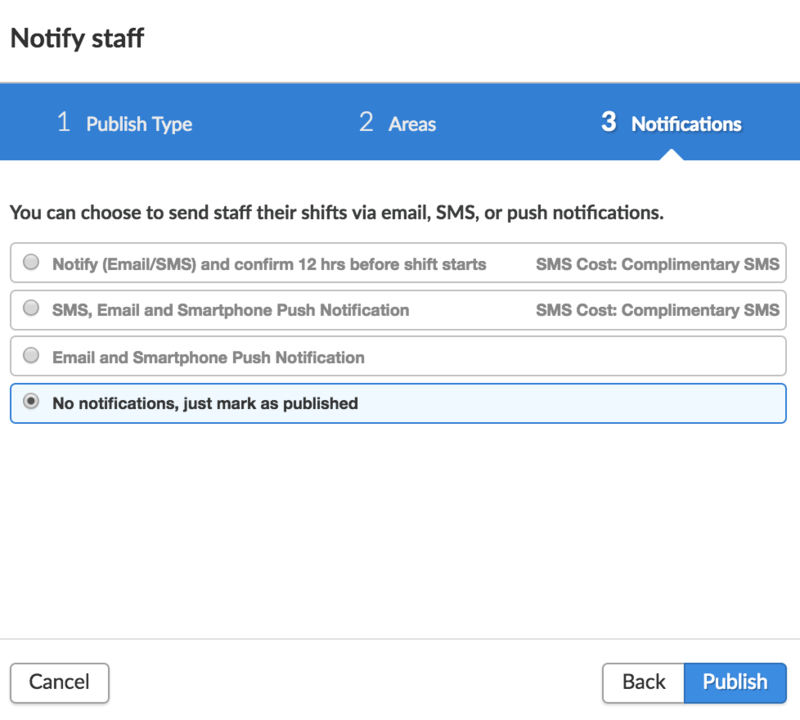 Publish All - This will push notifications to all employees regardless of if one of their shifts have been changed/edited. 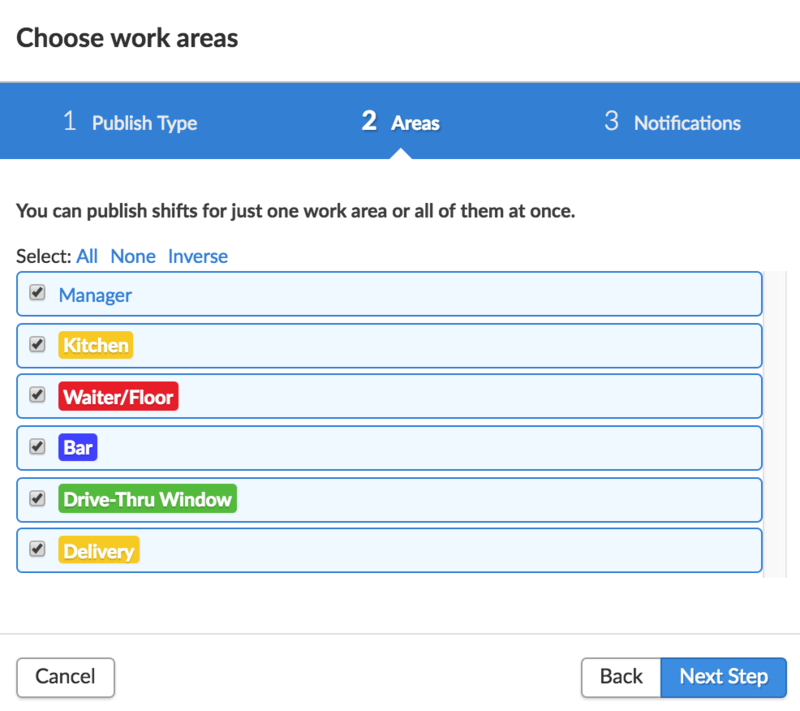 This option allows you to send notifications about shift changes to specific areas. For example, if a special function is planned at a restaurant and you have updated specific areas such as floor staff and kitchen staff, you can select these areas that will be notified about the schedule updates. 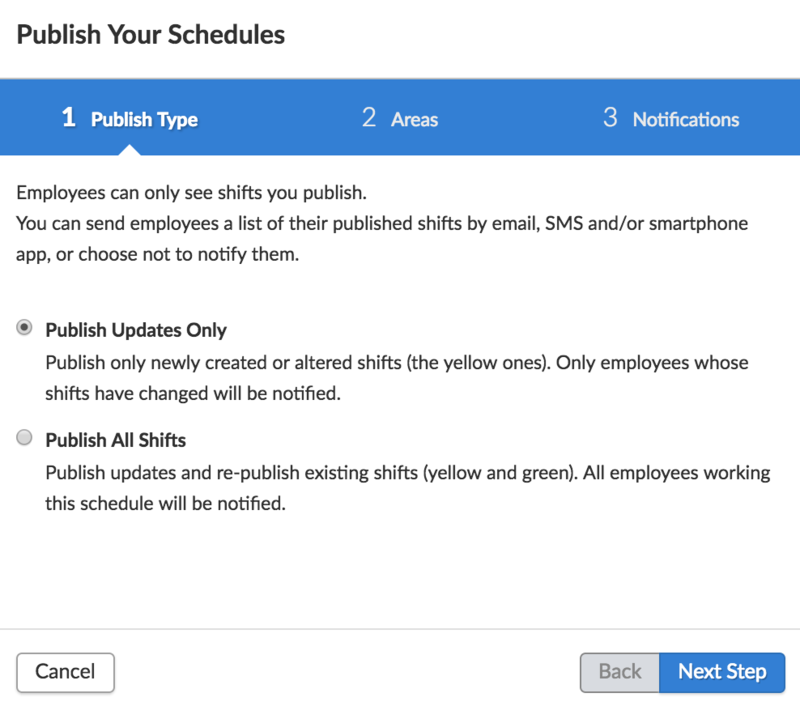 This option allows you to select how employees will be notified about the shift. We have three separate options. Notify (Email/SMS) and ask for confirmation - This will send out an email and SMS, provided they have a mobile number entered in their employee profile. Confirmation requires the employee to accept or decline the shifts by clicking a link sent to their email or replying to the Deputy SMS with y[shift ID] or n[shift ID]. SMS, Email, and Smartphone Push Notification - The employee will receive a notification via Email, SMS and a push notification via the Deputy smartphone app. Email and Smartphone Push Notification - Much like the above, but no SMS, just a shift notification via email and smartphone application. No notification, just mark as published - Will not notify employees, but will turn the shifts green (confirmed) when checking Deputy via the web browser and smartphone application. Now click Publish and all shifts should change to green, confirming that they have been published.